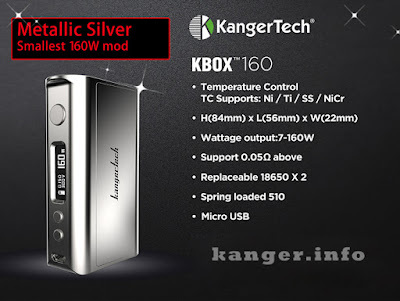 Kanger KBOX 160W Box Mod arrived today, it is the smallest 160w mod of Kangertech. It comes with a beautiful and sleek zinc alloy finished case, featured with a 510 spring loaded connector, which matches perfectly with most of tanks. KBOX 160W temperature control mod powered by two 18650 cells which can fire up to 160W maximum power output, also support Ni/Ti/SS/NiCr four TC mode.